Sitting watching the sunset, after a great day, congratulating ourselves on successfully reaching Plymouth. Monday we set sail from Yarmouth heading for Portland, there was a bit of mist but it was forecast to lift mid-morning and we had the tide with us for an early start. We shot through the needles channel at eleven knots straight into a bank of fog, not a pea souper but enough to make the going a bit percarious. Had it not been for our AIS, a VHF signal that all commercial vessels and now many pleasure boats broadcast, that shows their position, we would have felt quite exposed. But nobody else was stupid enough to be out and the screen was clear. Then out of the gloom, screaming straight for us came a military speed boat. Trying to squeeze a course as close to our track as possible with the wind on our nose we had strayed into the Lulworth Gunnery Range and they were live firing. We were abruptly instructed to sail 240 degrees for 31/2 miles. So down came the sails and rather sheepishly we motored off. After forty minute we could turn back towards our destination and as if by magic as we arrived at the marina the fog disappeared. We had made it through the first day. Tuesday it was on to Dartmouth, again the wind wasn’t kind to us but we did manage to sail a bit of the way and at least with better visibility we could enjoy the scenery. We gave Portland Bill a wide berth but the sea was still very choppy and it was cold, we both had on about five layers and full wet weather gear. Now for you non sailing girls let me now explain what problems this causes. Going to the loo is a nightmare, you put it off and off and off until you just have to go. The boat is bouncing about and often healed over at an angle, just getting to the toilet is a challenge. Then wedging yourself upright by leaning against the wall you start to unwrap yourself. First comes the fumble to get the life jacket clips undone, then off comes your Musto jacket, a confusion of zips and Velcro and then the dungarees. Now down to your normal clothes a certain urgency ensues, you wish you hadn’t left it so long. If you are lucky you are on a tack that slopes you on to the toilet, if not you have to wedge yourself on and have the added pleasure of the toilet seat snapping at your bum. Finally it’s back on with everything and you return to the cockpit at best sweating and exausted, at worst feeling seasick and swearing not to drink anything more until you reach port. 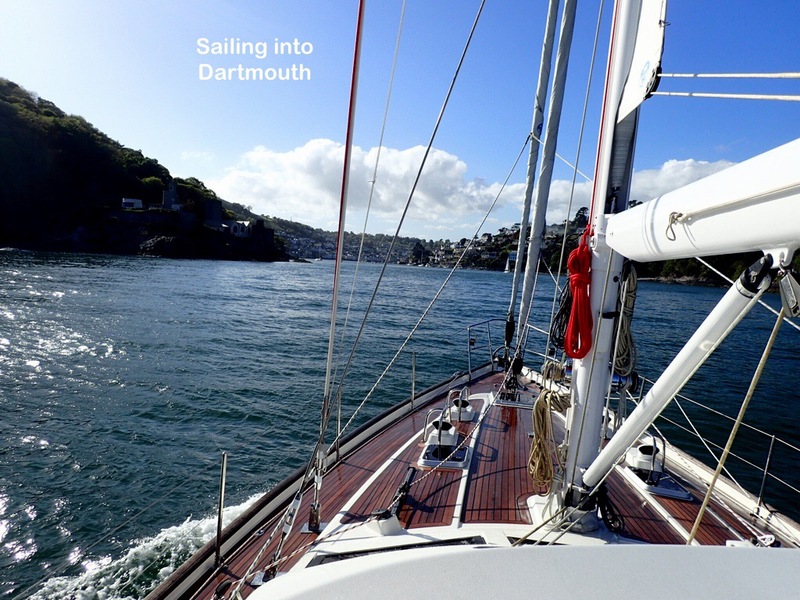 Although having a reputation of being quite tight fo space we had been looking forward to visiting Dartmouth, we have been many times before, on land, looking out at the yachts wondering how it would feel to arrive by sea and here we were doing just that and it didn’t disappoint. Even the sun came out reflecting off the hundreds of colourful houses that line the steep banks of the Dart river. We had been directed to what turned out to be a too small berth and there was a hairy few moments as Rick had to manoeuvred us out of the small space and we motored up to the end of the visitors pontoon. On the dock, at the only space available, in very big letters were the words No Berthing, Landing Only, but the Marina office was closed for the night and we were off at seven the next morning so decided to risk it. Wednesday dawned a sparkling sunny day and the wind had veered to the East , making for a perfect days sailing. It was almost warm, the wind was behind us and we made the trip on just three tacks. We arrived at the mouth of the River Tamar at midday, this is another place with connections for us. We waved at Cawsand Bay as we past, the birth place of my Father, his Parents, his Grandparents and their Parents, as far as I can trace them back and the location of my first remembered summer holidays. We saw the little chapel we had climbed out to perched on the end of Rame Head and we spotted the house on the cliff in need of refurbishment that we viewed as a potential retirement plan before this bigger plan took shape. 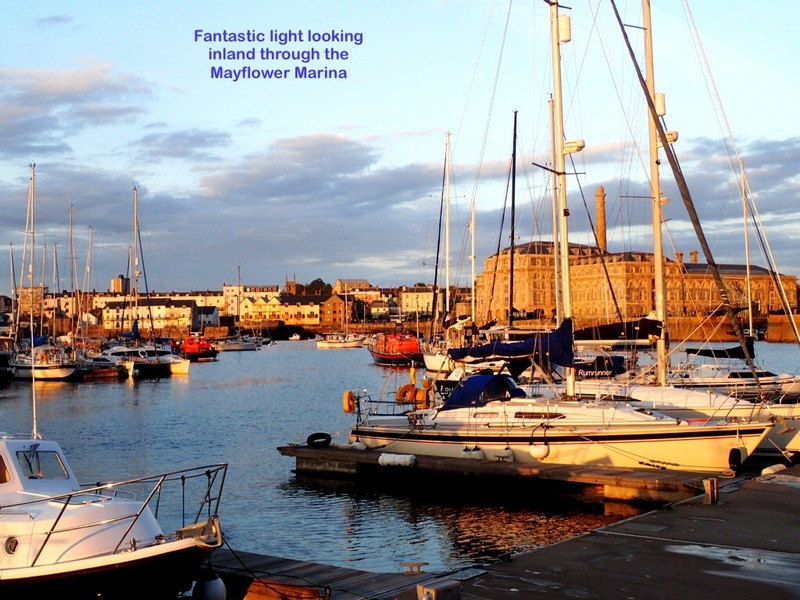 We had arrived in Plymouth, our first big challenge completed. This entry was posted in UK by Roz. Bookmark the permalink. Will do, did wonder if you were around. Polite, but you definitely weren’t going to question them. We did think, they were probably out for a bit of jolly, after all they could have just called us on the radio. Was with you every button velcro strip loop and tuck of the way. Another giggle making missive. Strangely enough am looking out over the needles at barton on sea tearoom with mum and believe it or not about to try and negotiate the loo with her in a place with no disabled facilities…Whole thing could make the daily mail front page! Never mind the shower blocks, Ricky needs sun block ! We do plaster on the sunblock even when it’s cloudy but still end up red, I think the wind gets us too. Rick using hyper expensive French stuff found by my sister because it doesn’t run into his eyes!!! Oh – and I meant to say, you write really, really well. I love reading your blog. Brilliant. Guys I don’t know if you remember the last time we meet was at Richard Lambs 50th Birthday and house warming party in Tenterden. Think it must have been around 2yrs ago and your adventure was mere idea, and look now it’s reality!! This is Diane & I best wishes on your amazing adventure round the world, so envious of you both. We have been following you on Boat Beacon from the word go and getting use to this amazing App. Seeing you are in Plymouth now. 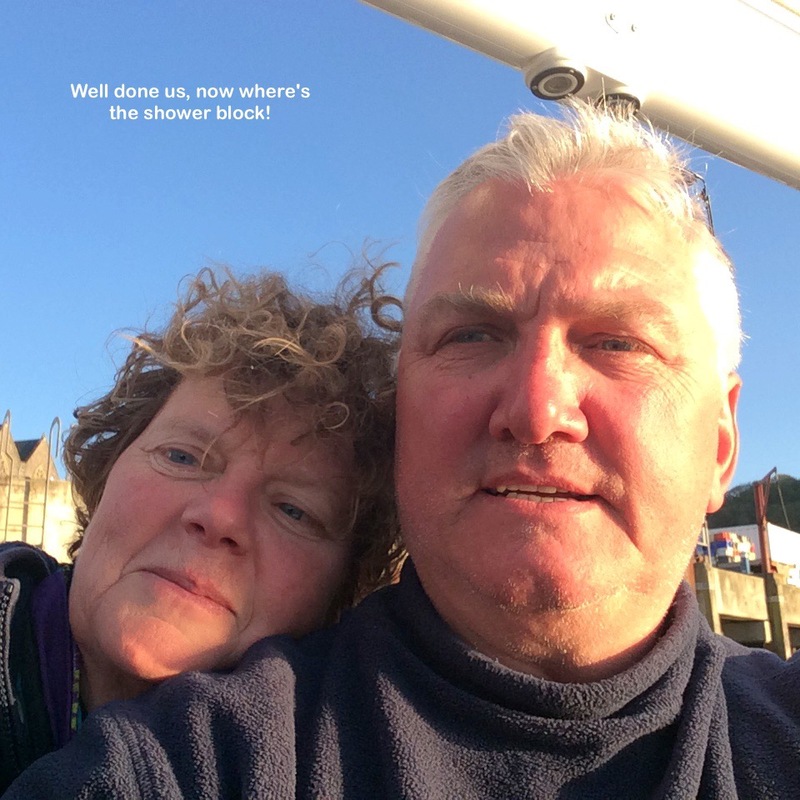 We believe chatting to Phil & Julia you are imminent to depart from Plymouth to Northern Spain on Sunday 16thAnd would just wish you a wonderful amazing and safe adventure on your 3year voyage ahead of you guys. We will be following you round with all the other bloggers tracking you with this amazing App. So if you stray off course (as in Lulworth) lolol we can correct you!!!!! Incidentally we have a friend Mick who every 6weeks is on his boat down in Gib who would like to touch base with you, he’s mored in the Main Marina there. So if your free I’ll put you in contact with him. Sorry “Roz” not Ross silly us !!!! Tracking your course at present and see your 60NM off the french coast. Incidently my friends boat is mored in Ocean Village, Marina Bay, Gibralter, it’s a 40ft sports cruiser called “Shades”. Yes we lost you too, think you were about 40NM off France. Hope everything is good. Wow “Raya has nearly Landed” as I track you into A Coruna. Lost you 24hours ago, then you popped up on “Boat Beacon” last night when we looked at 22.00hrs UK time. Congratulations all of you for arriving safe. Time now 05.00hrs UK time. P.S. I’m sure you are all already for a well nice Spainish Omelette loll!! Glad your back on BB again. Think u been off again for about 12hrs. Know dought you will enlighten us why u disappear. Hope your all catching up with all your essentials, sleep, supplies, & hope not repairs.